Family members of the five men who died while cleaning a sewage tank in west Delhi's DLF Capital Greens allege that this is not the work they were hired to do. Vijay Mishra choked up while saying this. His cousin, Umesh Kumar Tiwari (22), died on September 9 while cleaning the sewer plant inside the DLF Capital Greens housing society in the Moti Nagar area of Delhi. 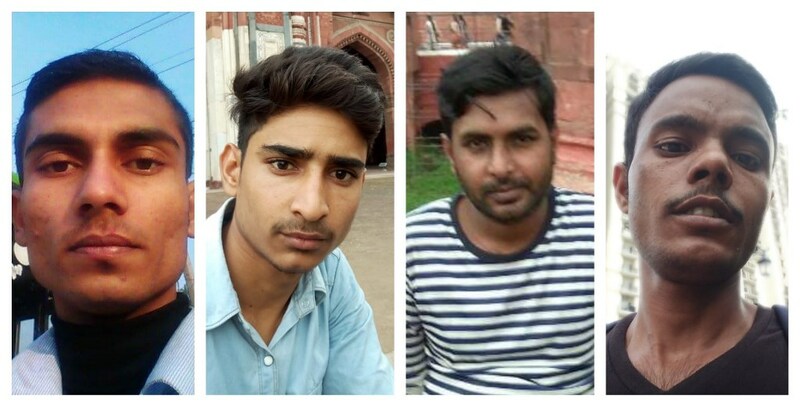 Besides Umesh, Mrityunjay Kumar Singh aka Raja (22), Mohammad Sarfaraz (20), Vishal (19) and Pankaj Kumar Yadav (26) also lost their lives in the horrific incident. They were all poor young men who had come to Delhi from various parts of the country in search of a livelihood. Each of them was responsible for providing two square meals for his family. None of the deceased were employed as sewage cleaners. Their family members say that all of them were hired via various DLF agencies to work in housekeeping, maintenance, motor operation and other jobs. Yet they were made to clean the sewage tank. The family members maintain that all of the deceased were forced to go down into the sewer. Vijay was especially dismayed by the fact that the company did not inform Umesh’s family after the incident. Other family members besides Vijay also made the accusation that neither DLF nor any other company found it necessary to inform them of what happened, at the very least. Upon hearing of the incident from a different source, they had to run to various hospitals themselves searching for the victims. Thirty-seven-year-old Vijay Mishra has been living with his wife and kids for many years in the Prem Nagar settlement, which is very close to the DLF complex. Standing in the middle of the settlement, you can see the tall and grand towers of the DLF complex clearly. But inside the settlement, the narrow streets are clogged with tiny houses built right next to each other. There are mounds of trash everywhere. In many places dirty water from the open canals is overflowing onto the road. The fact that people who live here go to other parts of the city to do various kinds of cleaning-related work makes one wonder: Does the administration ever reach this place? In fact, it was quite difficult for us to locate Vijay’s house in Prem Nagar. Upon receiving news of the incident, we first went on September 11 to the complex where the incident had taken place. A large number of security guards were present. When we asked them where the deceased workers had lived, the guards and other security workers refused to say anything. They also undermined our efforts to learn more about the incident. They even objected to our standing near the gate and asked us to leave. In the end we were forced to make our way to the Moti Nagar police station, where the FIR for this case had been registered, yet we were disappointed even there. The police said that all of the victims were from outside the city and that we would not be able to find them there. Men who died in the incident (L-R): Mrityunjay, Sarfaraz, Pankaj and Umesh. After much effort, we learnt from a street vendor that one of the deceased, Umesh Tiwari, used to live in Prem Nagar. Umesh Tiwari hailed from the village of Tiwaripur in Uttar Pradesh’s Sultanpur district. He lived with Vijay’s family in their house in the Prem Nagar settlement. The rest of his family lives in Tiwaripur. Statistics indicate that by and large the people who die in sewer cleaning incidents tend to be from the Dalit community. In Delhi, mostly people of the Valmiki (Dalit) caste are victims of such incidents. But of the five who dief in this incident, Umesh was Brahmin and Mrityunjay Singh was Rajput, which are considered to be “high” castes. Umesh had studied up to Class 12. He was the sole breadwinner of the family. His household included his wife, eight-month-old daughter, parents, paternal grandparents and two younger brothers. Also read: How Does a District Keep Its ‘Manual Scavenging Free’ Status? When we entered Vijay’s house, we learnt that his children do not know of their uncle’s death. 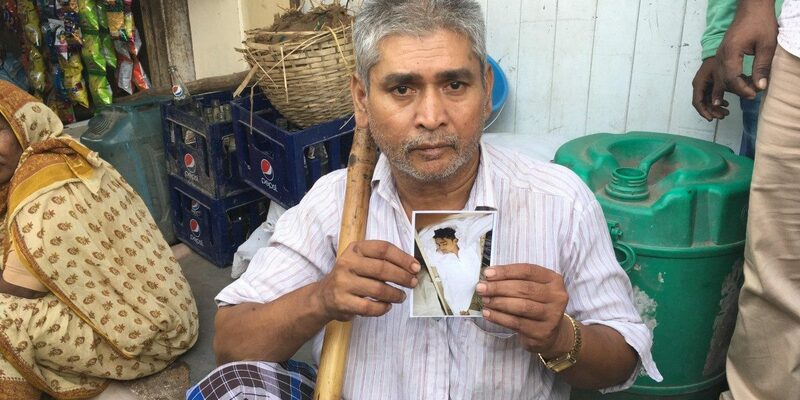 They have been told that uncle Umesh broke his leg in an accident and has gone to the village to rest. They eagerly await his return. Mohammad Sarfaraz of Anand Parbat, another victim, has a similar story. The shadow of his death still lingers on the face of his father Mohammad Hayul (50) and on the faces of his family members and even neighbours. Sarfaraz’s family is essentially from the village of Hariyat in Bihar’s Darbhanga district. They arrived in Delhi in the years 1984-85 in search of a livelihood and have since lived in various different parts of the city. After finishing school, Sarfaraz was studying for his graduation in social science from Delhi University’s School of Distance Learning. Due to financial difficulties in the family, he had been working for DLF as an assistant motor operator for the past ten months, for which he received a monthly salary of Rs 13,000. Besides his parents, Sarfaraz is survived by two brothers and one sister. His father has a disability and cannot stand up. His elder brother Mohammad Mehraj is studying for his BA and working alongside as an electrician in the Shadipur area. When we asked what conditions had forced Sarfaraz, a BA student, to have to work, his father said, “Because I am physically handicapped, he had to work to make up for my inability.” He also accused the company Sarfaraz worked for and the government for not providing any help or compensation although a week had passed since the incident when we met him. When at last they received Sarfaraz’s body, they did not have enough money to send the body to Bihar. A neighbour of Hayul’s told us that the other residents of the settlement had collected money so that Sarfaraz’s body could be sent to Bihar for the final rites. They also said that Sarfaraz’s 90-year-old grandmother is still in shock. Not just Sarfaraz’s family members, but even the neighbours have made the accusation that until now neither DLF nor the company who had hired Sarfaraz has said how the incident happened and why Sarfaraz was made to go down into the sewer. The settlement in Anand Parbat that Sarfaraz’s family lives in is a labour camp. It is also called “Transit Camp”. There, in the name of a house, the DDA has allotted the family one room. Neighbours told us that although according to one survey there are 2,800 houses in the settlement, but in reality the number is far higher. Each family is forced to make do with only one room. Two families live in some of the one-room houses. Just as in Prem Nagar, in this settlement too there were mounds of trash at every corner, open drains and mosquitoes and flies in large numbers. 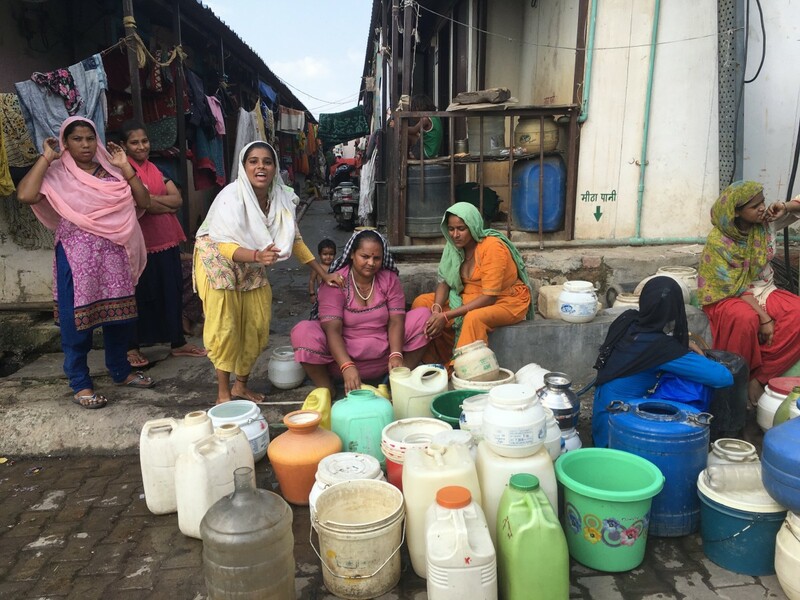 At various spots in the settlement, women in large numbers were collected to fill up water. Some people had laid mats on the street to rest upon and some had set up khatias in front of their houses to sit and sleep upon. The streets of the labour camp are so narrow that two people cannot walk abreast. The houses, or rather the rooms, are right in front of each other with almost no space in between. We tried to talk to the families of the other three victims, but we could not meet them. We managed, however, to speak with Mrityunjay Singh’s cousin Rohit on the phone. 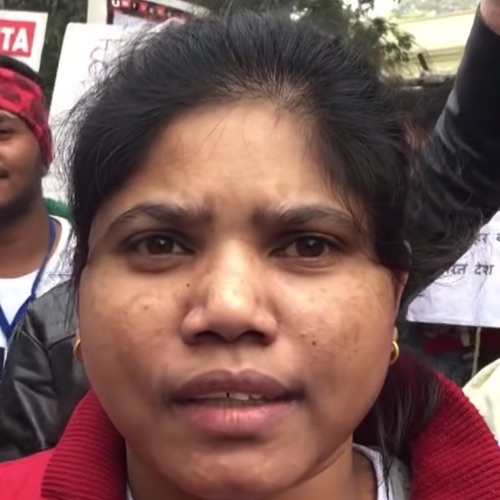 We also talked to another victim Pankaj Yadav’s cousin Krishna Yadav. Krishna himself has been working for DLF for some years. At first both brothers worked in Moti Nagar, but one year ago Krishna was transferred to Gurgaon. Pankaj was from the village of Sadat Binduli in Uttar Pradesh’s Jaunpur district. He had quit studying after finished Class 10. He had two children, a four-year-old son and a three-month-old daughter. Pankaj was working for Unnati Engineering and Contracts Private Limited, which had received a maintenance contract from DLF. 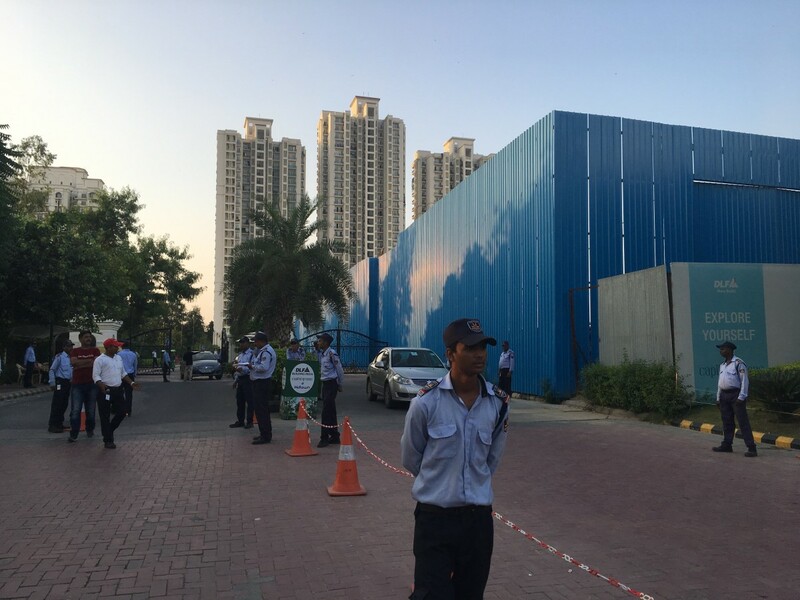 After the incident in the DLF complex, the police arrested the plant in charge. He employed by a company called JLL. JLL had outsourced the maintenance contracts of the complex to the companies Unnati and Crysta. According to the FIR, four of the deceased were working for Unnati and one for Crysta. The police has registered a case under Indian Penal Code Section 304. In the two days following the incident, many public statements were issued by both the Bharatiya Janata Party and the Aam Aadmi Party, but they have been silent thereafter (just like every other time). It is worth considering that an incident of this nature, in which a person dies upon entering a sewer for cleaning, has not happened for the first time in the nation’s capital. As many as 15 lives have been claimed in such incidents just in the last one year. In the entire country, there have been 11 deaths in the last few days. And in the last 5-6 years, 1,876 people have lost their lives in such incidents. Magsaysay Award winner Bezwada Wilson, the National Convenor of the Safai Karamchari Andolan, says that the number is 96 for Delhi. According to the National Commission for Safai Karamcharis (NCSK), since the beginning of 2017, one septic tank or sewer cleaner has died every five days. A 2013 law bans “manual scavenging”. Having to clean a sewer or septic tank by entering it without any safety equipment comes under the category of “manual scavenging”. Translated from the Hindi original by Karan Dhingra. You can read the Hindi version here.